Paul Juhn, age 16, attends Vernon Hills High School. He began playing the piano when he was four years old. He currently studies piano with Emilio del Rosario, cello with Blake Brasch, and chamber music with Mr. Hans Jensen at the Music Institute of Chicago. His former piano teacher was Dr. Soo Lee at the Music Institute of Chicago. He won prizes at many competitions including CAMTA, the North Shore Music Teachers Association, the Illinois Music Teacher’s Association, and the Granquist Music competition. He has placed first in the Primary, Junior, Intermediate, and Senior division of the Society of American Music competition and was the alternate in the MTNA Junior competition in 2004. 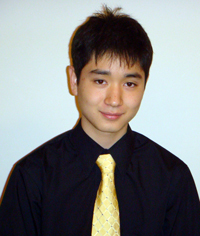 In 1998, he was the youngest winner in the piano division of the Midwest Young Artists Concerto competition and an overall win at the 2003 Walgreens Concerto competition. Paul has won first place in both the junior (2005) and senior (2007) divisions of the Sejong Music Competition and was a finalist in the CSO Youth Auditions. He has given many public performances, including the Young Steinway Series at the Skokie Public Library (2001) and on WNIB radio station as one of “Chicago’s Most Promising Student Pianists”. Recently, Paul performed at a Gala Celebration for the Music Institute of Chicago and in the “East meets West” series with Korean themes. Paul will be making his orchestral debut playing the Carnival of Animals with the Chicago Symphony Orchestra in February and in March will play in the “Music in the Loft” Series.